LAUSANNE, Switzerland – The local organizer – the Mexican Baseball Federation – has informed that a hurricane struck the coast of Baja California Sur, forcing local officials to secure two new host cities for the eighteen-nation 15U Baseball World Cup: Mazatlán and Culiacan, which are directly east of the original host city of La Paz and directly across the Gulf of California. As a result of the hurricane, Mexican Baseball officials have reported that repairs and ongoing renovations to the three venues in Baja California Sur will not be completed in time for the start of the 15U event, particularly as government/city officials shift efforts and resources to focus on general hurricane recovery in the region. IBAF officials in Lausanne have granted the request of Mexican Baseball Federation president, Alonso Perez, to transfer the World Cup to the new host cities in the state of Sinaloa, where there are guarantees for a smooth delivery of the event. The dates of the 15U Baseball World Cup, 31-Jul to 10-Aug, will remain unchanged, guaranteeing that the competition format, schedule and groups will remain identical. A total of eighty-three games will be showcased over eleven days. 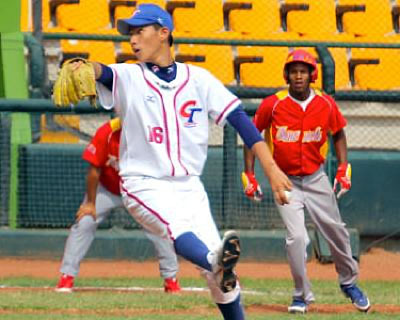 Both IBAF and Mexican Baseball officials have been given assurances that the organization of the 15U Baseball World Cup will be fully supported by Mexican city and government officials. Launched in 2012 and played every two years, the U-15 (ages 13-15) Baseball World Cup has established itself as the pinnacle of baseball in this age category -- and like the U-12 (ages 11-12) Baseball World Cup, the U-15 BWC is the only world championship across all of sport featuring National Teams, with the best young baseball players in the world, and future stars, representing their countries and uniting on the Baseball World Cup global platform. Only in its second edition, the U-15 Baseball World Cup platform will potentially challenge what is arguably baseball’s toughest and best represented international competition, the U-18 Baseball World Cup – an event that has featured superstars like Canada’s Brett Lawrie, Japan’s Yu Darvish and Shohei Otani, South Korea’s Shin-soo Choo, Cuba’s Yasiel Puig and Aroldis Chapman, and USA’s Clayton Kershaw, Justin Upton and Buster Posey, among countless others – and which, in 2013, had a potential broadcast reach of 144 million homes and potential online/mobile reach of 20 million. The 2014 15U Baseball World Cup will have an unprecedented degree of global spread for a baseball event, one that spans Africa (North and South), the Americas (North-, Central- & South America and the Caribbean), Asia, Europe (Baltics, Central- and Southern Europe) and Oceania. It will be the first time either Africa or Oceania has ever been represented in the 15U Baseball World Cup, and the first time ever that each continent will send two representatives to a baseball world championship.